How to add annotations by using MVVM binding? Annotations are used to mark specific area of interest on the chart area. 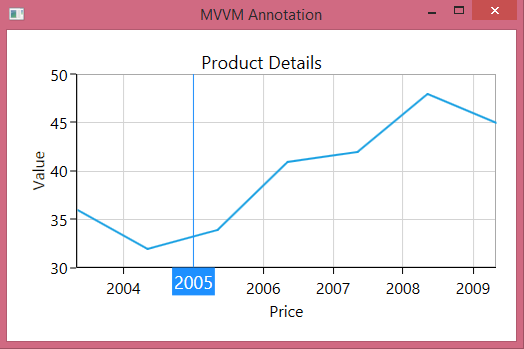 The SfChart allows you to add annotations by using MVVM binding. This article describes how to add annotations. You can create an annotation and add that to the AnnotationCollection property in the ViewModel. Then, you should bind that property to the Annotations property of the chart as illustrated in the following code example. The following screenshot displays the chart with vertical line annotation. Figure 1: Vertical line annotation.